While all of the seasons can wreak havoc on your roof in different ways, the wintertime is probably the most difficult one for your home’s roof. Between the snow and ice and the freezing-cold temperatures, your roof is forced to deal with a lot of inclement weather during the winter. Therefore, once spring comes back around, it’s important for you to take steps to maintain it. Here are a few things you should definitely do. Inspect the valleys on your roof. Throughout the end of the winter and into the spring, water runs down your roof valleys all the time. These valleys are, therefore, susceptible to water damage and might show signs of wear over the years. You should take a close look at them to see if they might be wearing out. If they are, you’re going to want to have a roof contractor come and take a look at them to see if you need to take any steps to prevent them from becoming problematic. Check for cracks in your shingles. Your shingles go through a lot during the winter. They are responsible for keeping water from snow and ice out of your home. The whipping winds of winter can also cause them to blow away or wear down. You should check your shingles for any signs of cracking. Shingles will also start to curl up over time as they wear out. If this is the case, you may need to consider replacing all or part of your roof. Make sure you don’t notice any water spots inside your home. 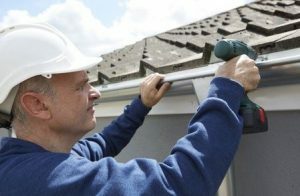 While the majority of your roof maintenance will need to be done on the outside of your home in the spring, there are some things you can do inside to make sure your roof is in good shape. One of these things is checking your ceilings for signs of water. You can also climb up into your attic and see if you can spot any signs of leaks up there. If you need help maintaining your roof this spring, Roofing by Bruce can send a professional to get the job done. From inspecting your roof to repairing it, we can handle it all. Call us at 570-424-8891 today to make an appointment.